Do you ever get the urge to make croissants from scratch? No? Really? That’s odd. I often get that urge, but I’m usually able to sensibly squash it. I can tell myself, “Nah, maybe just do your laundry tonight,” or, “Salad is pretty good, maybe you should just make that tonight, Tory.” But about a year after I first made croissants in my week-long French experiment (see About Me), I couldn’t deny myself any longer. It was time to make these fluffy, buttery, flaky treats again. 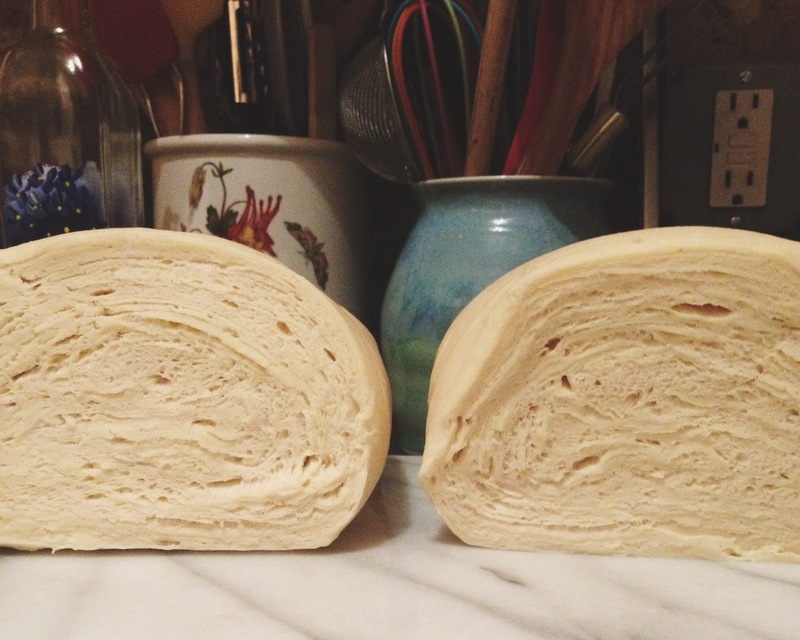 So, one Monday night in the not-too-distant past I assembled my flour and all the butter in Brooklyn (meaning 4 sticks – I’m a little hyperbolic, I guess) and got to work. 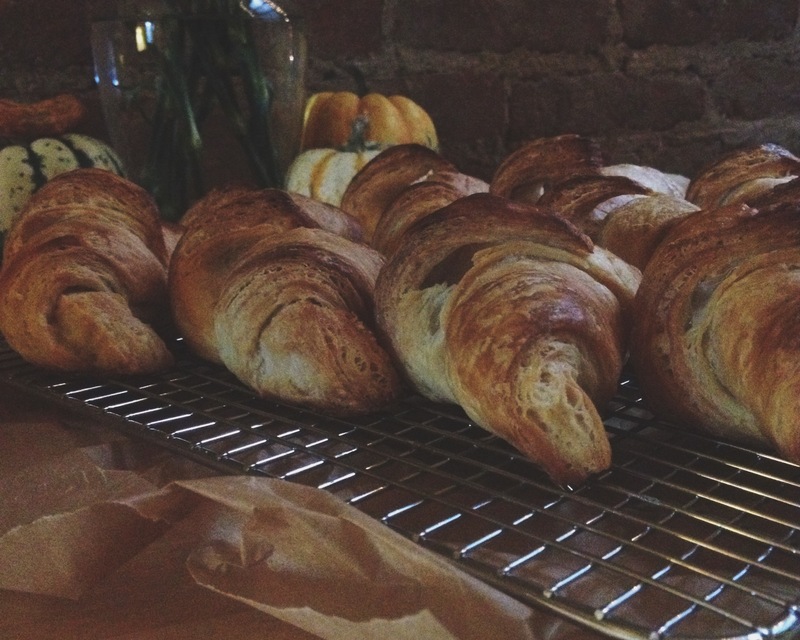 Making croissants can seem like a daunting task. The only reason I made them from scratch last year is because I was driven by the frenzied, competitive voice in my head that said, “Make EVERYTHING from scratch, Tory, and you will WIN. Make croissants from scratch, make bread from scratch, go milk a cow and try making brie from scratch. Do it.” (I did two out of those three things. Maybe if I’d done the third I would have won. Shucks.) Up until that Monday night two weeks ago, I still thought making croissants was pretty ambitious. Then I realized it mostly seemed that way when I also made bread, eggs en cocotte, and rack of lamb persillade in the same day. When you’re just making one thing, it’s totally doable. a pinch of butter, please. The thing about croissants is that making them does take time. A lot of inactive time, actually. You need to wait for the dough to rise, and re-rise, and then rise again. Oh yeah, and you also have to let the BUTTER SQUARE become cold again after you’ve molded it with your bare hands. And to me, the toughest part of making these beautiful pillows of simple decadence is making sure you have enough friends to share them with (maybe that’s not a problem for you, show-off). The point is, they’re best eaten day of, or maybe the day after with a little help from the toaster oven. To solve that problem, I bring them to work to bribe people bring a little sunshine into everyone’s morning. not quite smooth and elastic yet…but getting there! If you don’t feel like force-feeding your coworkers, maybe try making them for a brunch party. It’s either that or eating twenty-four croissants by yourself. If you’re okay with yourself if you do that, then I say go for it! There’s your Martha tip for this post. you put the butter in the dough-y thing, you flatten it all out. I found the recipe on King Arthur Flour’s website. They’re a really great resource. For more photos and even more detailed instructions, I encourage you to see the recipe on their page. I followed this one pretty closely. Last time I made these, I had to use probably two more cups of flour than they tell you to, but this time it worked out perfectly. 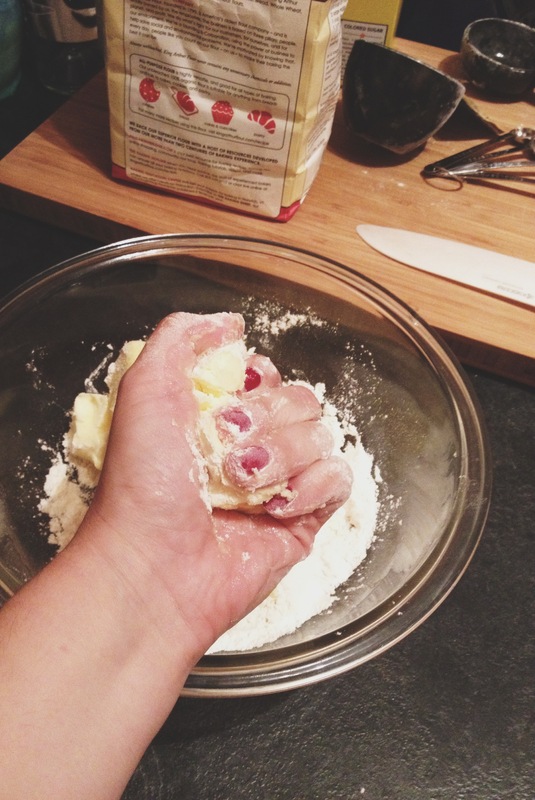 Like most recipes that involve kneading, the amount of flour may vary time to time. beginning of step 10 – look at all those layers! 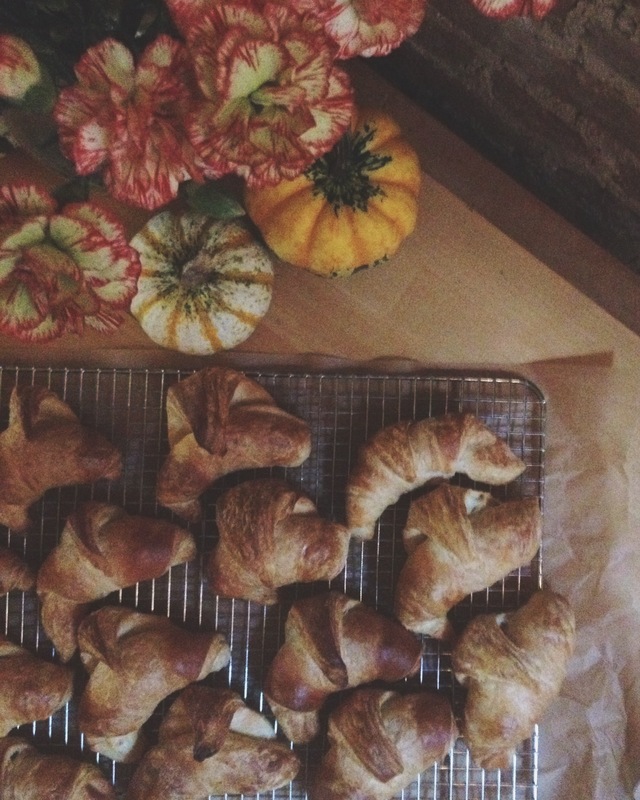 Now hunker down and get to it – you’ll have beautiful, homemade croissants in no time. And ps. you can leave them shaped in the fridge overnight and bake them off in the morning for what seems like minimal effort! Plus, you can stuff them with chocolate, ham and cheese, or anything else that sounds good to you. Enjoy! For the dough: Make a sponge by cracking the eggs into at a 2-cup liquid measuring cup and then add enough warm water to equal 2 cups. Beat until blended and pour into a large mixing bowl. Add 1 tablespoon of sugar, 3 cups of flour, and the yeast. Mix until blended, cover, and set aside. For the butter: While the sponge sits, set up the butter inlay. 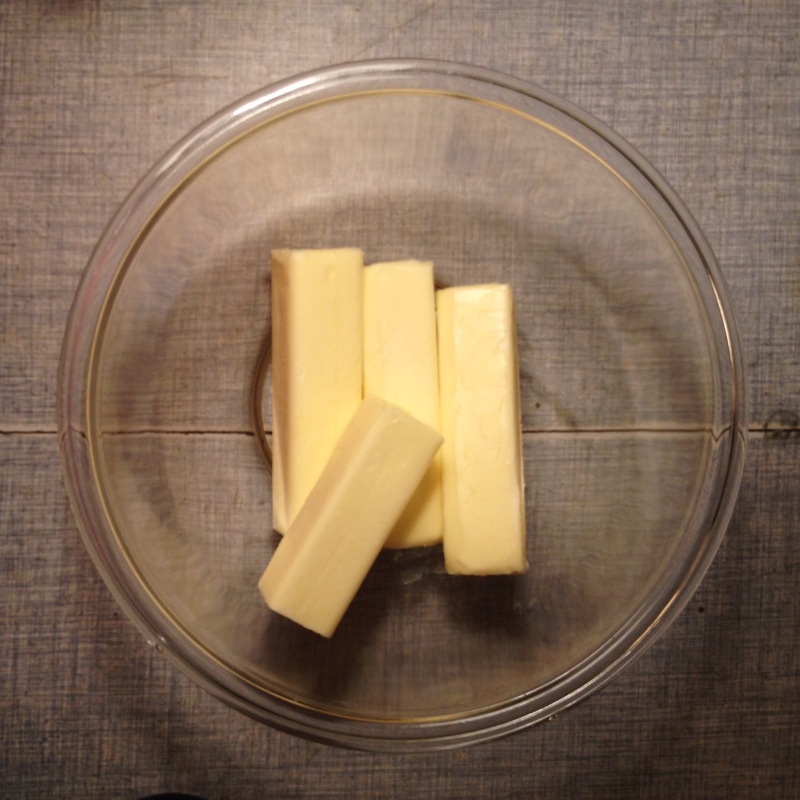 Mix the butter with ½ cup of flour until the mixture is smooth and well blended. This can be done with a mixer, a food processor, a spoon, or with your hands. If using a machine, be sure not to beat the mixture at a high speed. Thia incorporates air into the mixture. Lightly flour a piece of plastic wrap. Place the butter mixture on it and form it into an 8-inch square. You can use a dough scraper to form the edges. Wrap it up and put it in the refrigerator (on a flat surface) for at least 30 minutes. Finish the dough: Stir the vanilla and melted butter into the sponge. Whisk together the remaining 2 ½ cups of flour, the rest of the sugar, and the salt. 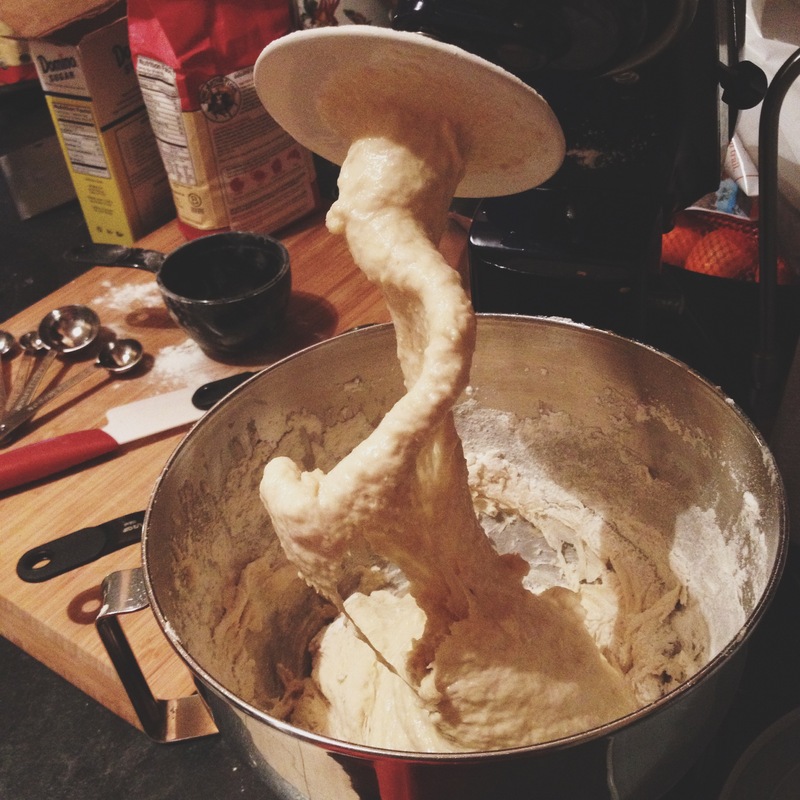 Add to the sponge and mix (use a dough hook if using a KitchenAid) until you have a soft, but knead-able dough. Check the dough after a few minutes, adding more flour if need be. Once the dough is smooth and elastic, pat it into a square shape, wrap it loosely, and refrigerate it for at least 30 minutes. 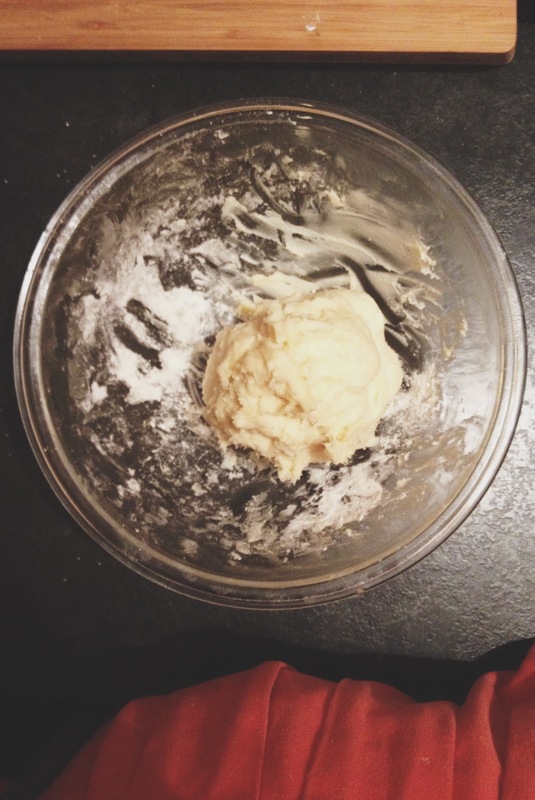 Rolling in: Remove the chilled dough from the refrigerator and put it on a lightly floured surface. Roll it into a 12-inch square. Unwrap the butter slab and place it in the center of the dough at a 45-degree angle. It’ll look like a diamond in the square. Fold the flaps of the dough over the edges of the butter until they meet in the middle, like a square envelope. 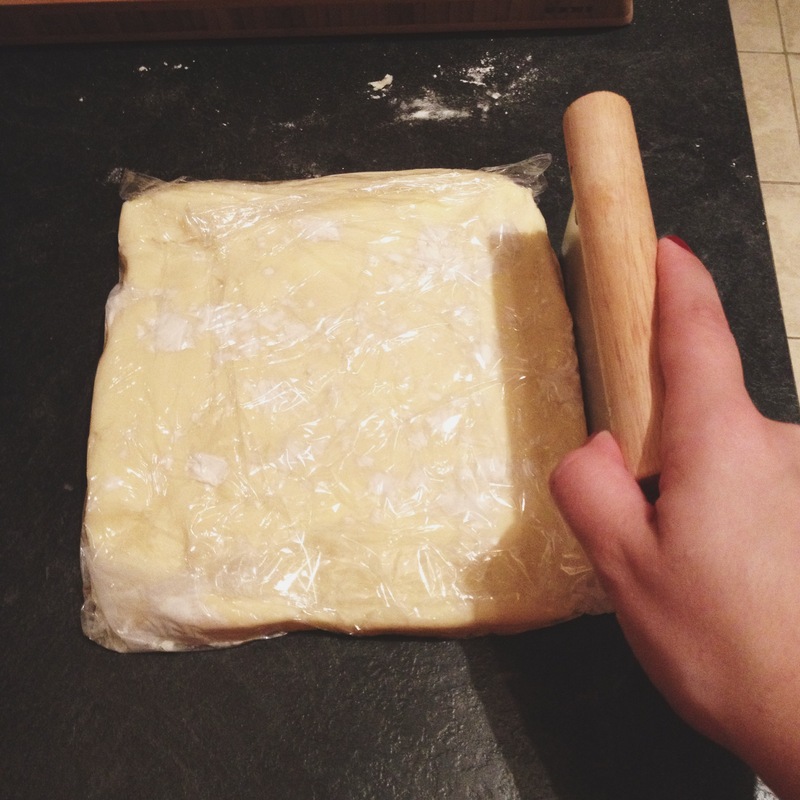 Pinch and seal the edges of the dough together (moisten your fingers with a little water to seal, if necessary). Dust the top lightly with flour, then turn the dough over and tap it gently with the rolling pin into a rectangular shape. Make sure the dough isn’t sticking underneath, and if it is, dust with more flour. Roll the dough into a rectangle measuring 20 inches by 10 inches. Turn the dough package 90-degrees to the right, so it looks like a book ready to be opened. Roll and fold again, like you just did. At this point (two turns), wrap it again and return to the fridge for at least 30 minutes. After half an hour, repeat that process, landing you at four turns, wrap it and refrigerate for at least an hour, and maybe overnight, before shaping the croissants. 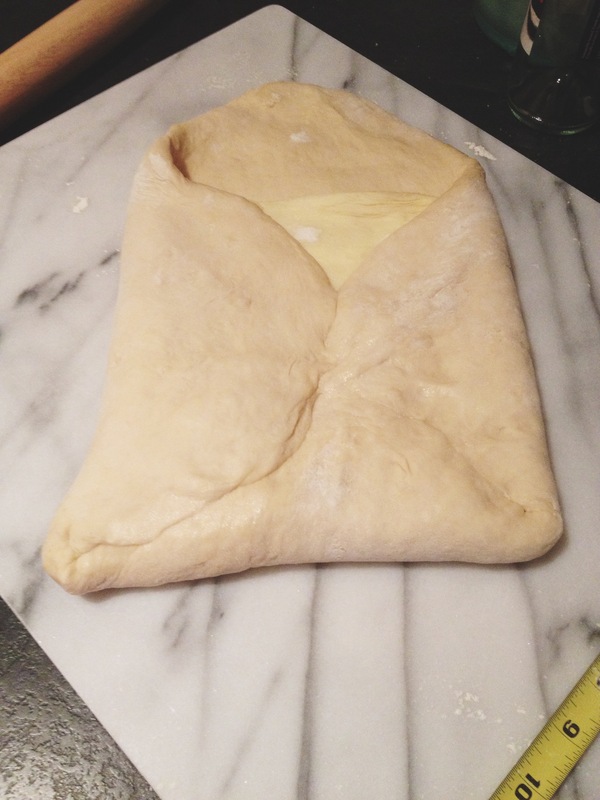 Shaping the croissants: Using half the dough at a time, roll it to a 12”x18” rectangle. 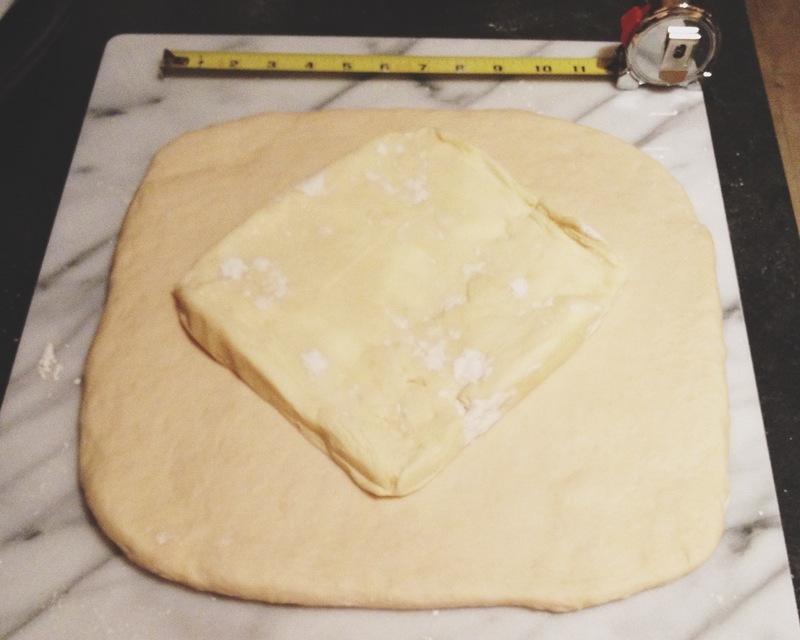 Trim the edges of the dough using a ruler and pizza wheel, or just use your eyes and a knife. 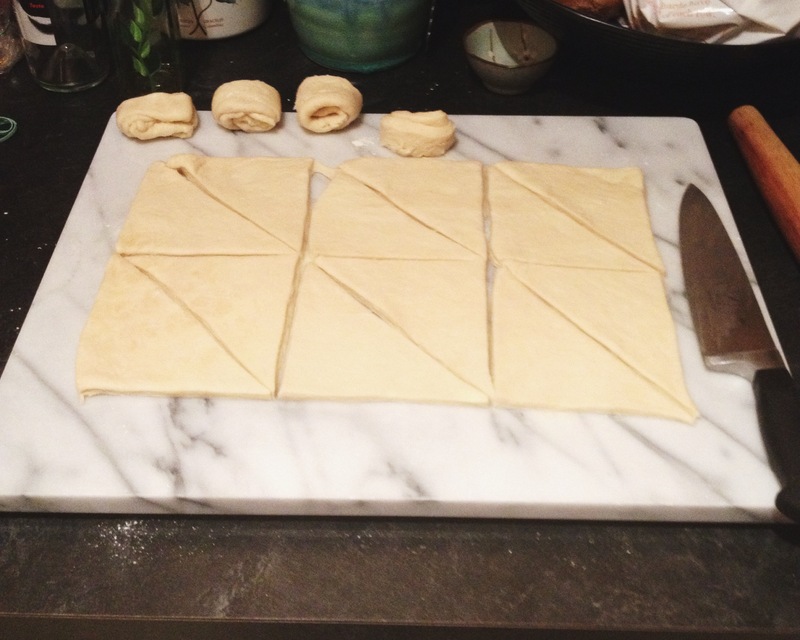 Once trimmed, cut the dough in thirds length wise and then in half through the middle. This will give you six 4”x9” pieces. Then cut each piece diagonally. Roll the large base of the triangles towards the tip. 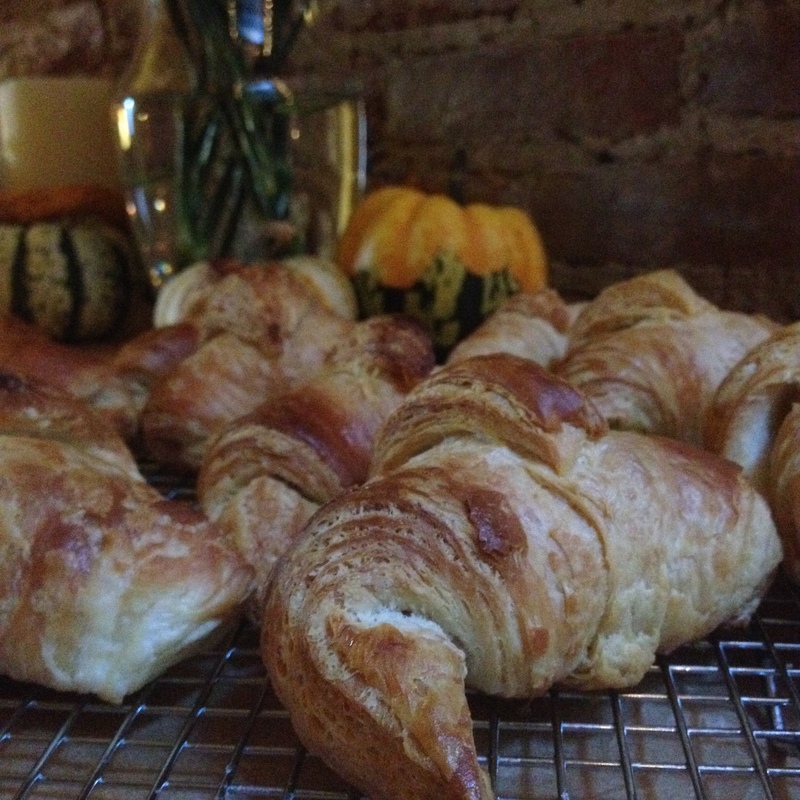 Make sure the point is tucked under the bottom of the croissant, stretching or using a dap of water to make it stay. Form the crescent by bending the ends toward the center where the tip is tucked. Place the croissants on a lightly greased or parchment-lined baking sheet. Cover and chill for 30 minutes, or overnight. To bake the croissants: Preheat the oven to 425-degrees and take the croissants out of the fridge. While the over is heating, brush the croissants with an egg wash (one beaten egg with a tablespoon of water). When the oven is hot, bake the croissants for 15 minutes, then reduce the oven’s temperature to 350-degrees and bake for another 15-20 minutes. The croissants will look golden brown. Remove from oven, place on a cooling rack, and congratulate yourself heartily. Good job!